If you work at a computer, there’s a good chance you experience computer eye strain. 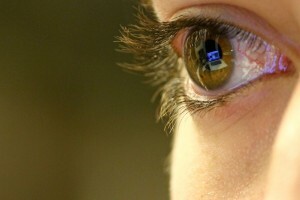 Eye strain and associated symptoms from prolonged computer work such as blurred vision, headaches and muscle strain are called computer vision syndrome, or CVS. Having a routine comprehensive eye exam is the most important thing you can do to prevent or treat computer vision problems. It is recommended that computer users have an eye exam every year. During your exam, be sure to tell your eye doctor how often you use a computer at work and at home. The doctor may recommend a specific prescription for the computer distance and all glasses wearers can benefit from an anti-reflective coating, which decreases glare and eye strain. A good rule of practice is 20-20-20, which means for every 20 minutes on the computer take a 20 second break and look at a target approximately 20 feet in the distance. Our eyes tend to lock into focus at a close working distance, so the break will force the focusing system to relax. Additionally, when we are concentrating on near tasks our blink rate goes down, so consciously attempt to increase your blink rate during the break, which will help reduce the risk of dry eye. Any of these simple adjustments can help keep eye strain to a minimum. If you have any questions feel free contact our office at (910) 219-3937. Dr. Taylor would be happy to talk with you about your specific needs.